Learn how to toast coconut two different ways: In the oven and on the stove in a skillet. 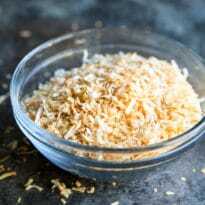 Works for shredded or shaved coconut, sweetened or unsweetened! In a medium skillet over medium-low heat, toast coconut until lightly browned and fragrant, about 3 to 5 minutes. Preheat oven to 350 degrees. Spread coconut evenly on a rimmed baking sheet. Bake until lightly golden and fragrant, stirring frequently, about 7 to 10 minutes.